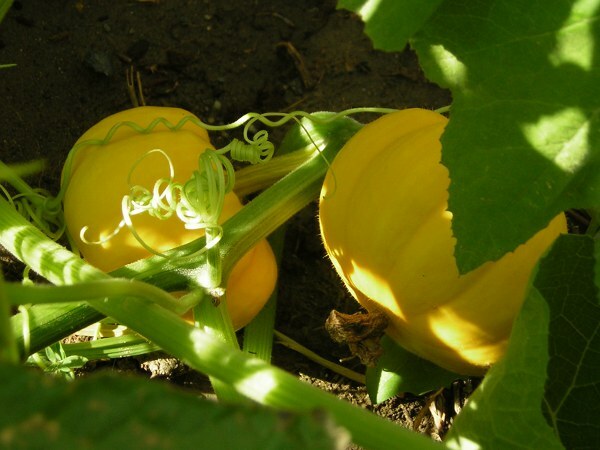 The tiny pumpkins growing in my garden are "Jack Be Little" pumpkins, and they are both decorative and good eating. I decided to try one today, following a "recipe" found on this page. Basically, I cut a hole in the top of the pumpkin, scooped out more insides than it could possibly have held (transcendentally dimensional pumpkin goop! ), put in some butter, brown sugar, and cinnamon, and baked it for 30 minutes at 350 degrees F in a pan with a little water in the bottom. Didn't work. Well, sorta worked. It needed another good 15 minutes, and maybe I should have poked around the edges to let it bake better. The bits that were cooked were REALLY good, but the bits that were not cooked... ug. Let's just say it needs to cook until tender, not just until it appears to be tender. There are a ton of recipes for the little guys all around the web, and they were fun to grow, if heart-breaking when one vine died off suddenly and possibly early (a massive windstorm followed by heavy rain hit and killed half my garden, right after I posted the last update). So I think I'll try them again next year and hopefully I'll have enough on the other vine this year to give this a try again. I think they would make fantastic desserts if they were properly cooked all the way through. I also learned that this type of pumpkin can be taught to grow up a trellis, like a tomato plant, so next year I might try that so I can get the plant growing up as well as out. I have big plans for my garden next year, but I need to sit down and actually plan it out along with what I need to do and when. My biggest goal is to get proper irrigation in place for next year. I hope I'll have the time and the money to do it. Oh yeah, one more thing I learned about these. Do NOT grab them by the stem until they've been properly cleaned and scoured. They have needle-sharp tiny thorns and they will get you and they will hurt. Wear gloves and cut them three inches from the fruit, and pick up by the fruit. Ouch ouch ouch. I tried growing pumpkin last year and only got a single "sugar pumpkin" out of the whole deal. It was my fault; I didn't spend enough time preparing soil and whatnot. Try a pumpkin soup, good stuff.